“Frida” is an English lady, with her modern classic lines, both elegant and well-built, designed sail the seas of the world in all weathers. Frida has a soul, a history, you can’t fail to fall in love with her! Schooner with Bermuda rigging, two masts (main mast at the rear), boom foresail (much like a mainsail). A very simple rigging, giving amazing balance in sailing for all kinds of sail reefing and combinations. While running, the surface area is doubled. The Ocean 60, well known both across the Channel and in the West Indies, was the first boat designed and built specifically for luxury charter in the Mediterranean and the Caribbean. Its specifications require that they be not only beautiful and comfortable, but also highly sailable, easy to manage with a small crew, and easy to maintain. Countless circumnavigations have been made by these boats – some have made four! Ocean 60s can be found in Patagonia Antarctica, Greenland, Norway, Alaska, Polynesia, New Zealand, USA, and the Caribbean. The Azores seem lost in the middle of the Atlantic, and it’s true! Known only to sailors for centuries, they have remained natural, majestic, welcoming and generous. 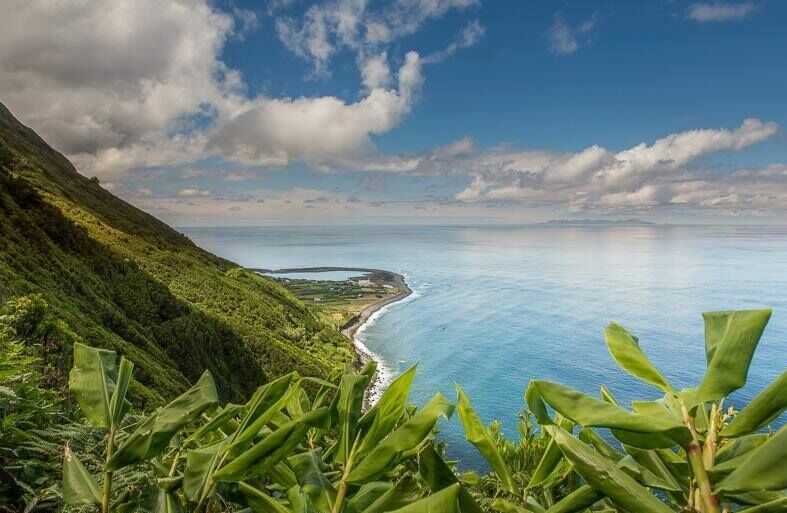 The Azores enjoy a gentle, mild and warm climate (average 25 ° in summer, water temperature 21-23 °). The Azores are an autonomous region of Portugal. One of the last quiet and authentic corners of the planet. The ultimate “nature” destination, far away from mass tourism. Superb wild landscapes, among the most beautiful in the world. A paradise for whale watching. Endless activities — hiking, diving, mountain biking, horse riding. The legendary kindness of the Azoreans. Countless historic and listed monuments. Excellent local produce, almost always organic! Frédéric Aujard is the happy skipper and owner of Frida, 56 years old, once a digger driver in maritime works, he later became a geographer, and science journalist. He has been a professional skipper for many years, regularly retraining. Since his childhood he has been sailing. Dinghy and cruise boats, becoming a sailing instructor at 16, then skipper at 18. While working in Africa, he built his first 36′ boat in Togo and then took to the high seas for fifteen years of adventures from the equator to the Arctic. After the Islands of the Gulf of Guinea, he went to settle in the West Indies, where he worked between shipyards and sailing charters. He has made some great getaways to colder waters, and many transatlantic crossings. Frida is his fourth boat, he has put all his experience as a sailor into her. He has been sailing to all the Atlantic islands – the Azores, Canary Islands, and Cape Verde for 25 years. His temperament is outgoing, he is passionate about his work! He loves to debate, discuss, read, cook and share his stories! Frida is a big boat. Her size gives exemplary marine behavior and high average speed in addition to outstanding comfort. No need to be an experienced sailor to be able to help out on deck. Supervised by your skipper, you’ll soon get used to all the maneuvers of a schooner! Each voyage is reasonably short — the single crossing from Sao Miguel to Terceira may take 10 to 14 hours, depending on the wind. Life on board requires a bit more organization and discipline than on land, but again, your skipper is there to ensure that everything goes well and that no one forgets his turn to do the dishes! You are on vacation, and so we’ll share the domestic tasks in a friendly way. Remember that the best cruises are where the food is best! Bed linen and towels are provided. Bring a small backpack for hiking. A good waterproof windcheater will do at sea and ashore. Bring a fleece for altitude, as well as hiking boots. If you have binoculars, bring them too! For charging phones, tablets and other devices, there are 220 V sockets in every cabin. At sea, at anchor, we only have a small power source working, so only two devices at once please. Laundry: there is a washing machine 7 kg on board, for use in port. Boat rental, 6 people max. Hostess: € 120 / day. Tours and hikes ashore, accompanied by the skipper. Flights to the Azores and back. * Children over six years of age are accepted on board, under the responsibility of their parents. Azores whales sanctuary. 24 different species recorded! The species most often encountered in the Azores are sperm whales, common dolphins, spotted dolphins, bottlenose dolphins and Risso’s dolphin. Other species pass through the Azores in certain seasons. Blue whales, the fin whale, the humpback whale and minke whale pass through between April-May and September-October. The Spotted Dolphin arrives in the Azores between May and June and stays until September (more than 300 animals each time). The pilot whale also arrives around April. It is sometimes possible to observe killer whales, beaked whales and striped dolphins – although this is rare! We respect the whale watching charter in the Azores. Maximum distance, behavior, security. We have a hydrophone on board, which allows not only to hear the whales and identify their “clicks” or songs, but also to locate them.